I normally try really hard to come up with super thoughtful gifts for my other half for Christmas, anniversaries, Valentine's Day and birthdays. The longer we have been together, the harder it gets. I feel like I have used up my good ideas already! I was really struggling to come up with a special gift this year, but this is what I ended up with. Hubby finished his career one year ago, and this was the moment that he will always remember. His "defining moment," I guess you could call it. (That's him, the QB, bouncing off people and eventually landing in the endzone.) Luckily for me, the newspaper photographer captured that special play in a sequence of photos that was just begging to be framed. I had plans to have it custom framed by a local art shop, but the quotes were coming in from $200-$400. I didn't have that type of cash to spend on this gift, but I was hoping I could get the same effect with a pre-made frame. 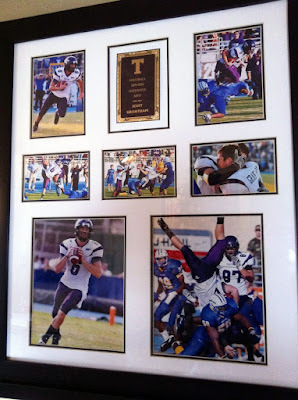 I had a hard time finding one because every frame looked a little too "family collage," not sporty and not masculine. 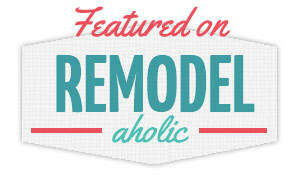 I found this frame, with glass and both black and white mats, for $20 in the sale section at Home Goods. It ended up working out perfectly! He was really excited and surprised by the gift, so my mission was accomplished. 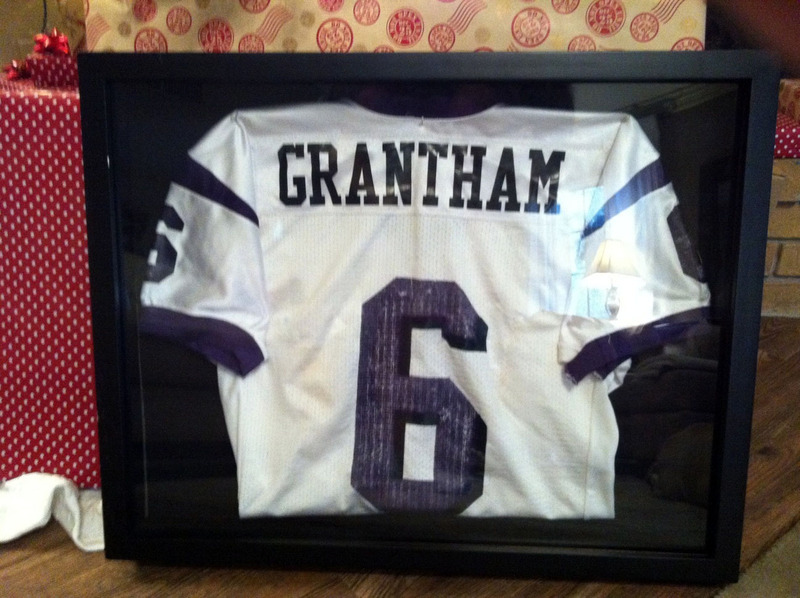 I think it will be great to put in his office one day when he is a big time football coach. He can be one of those old men that talks about the glory days and remembers that time they won in double overtime and he made ESPN, making his players roll their eyes. I can see it now! 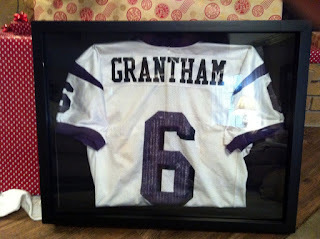 We're planning to create a sports memorabilia wall in our guest room, so we wanted some stuff from his football career. We also grabbed a shadowbox from Hobby Lobby (during their 50% off sale) and mounted his jersey inside it, and we think these two will go well together. 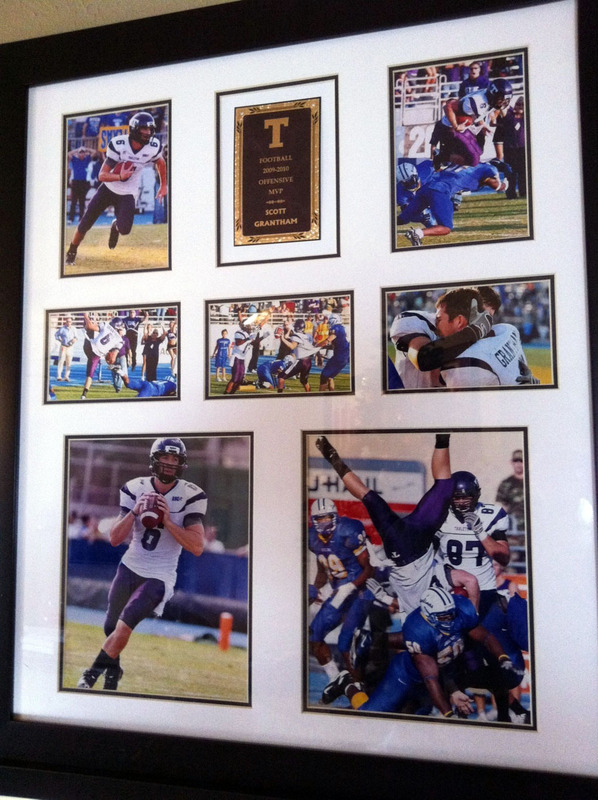 We also tried to have this professionally mounted and framed, but we didn't like the price for that option, either. 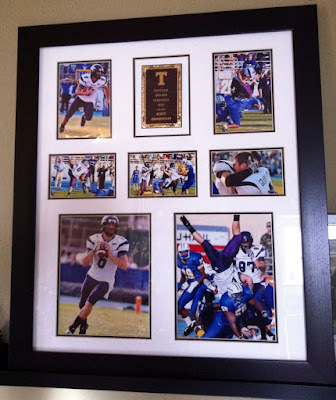 This shadow box was hundreds of dollars less than having it mounted by a pro, so we went for it! Anyway, I think these photo collages are an easy project and a great gift for anyone in your life. 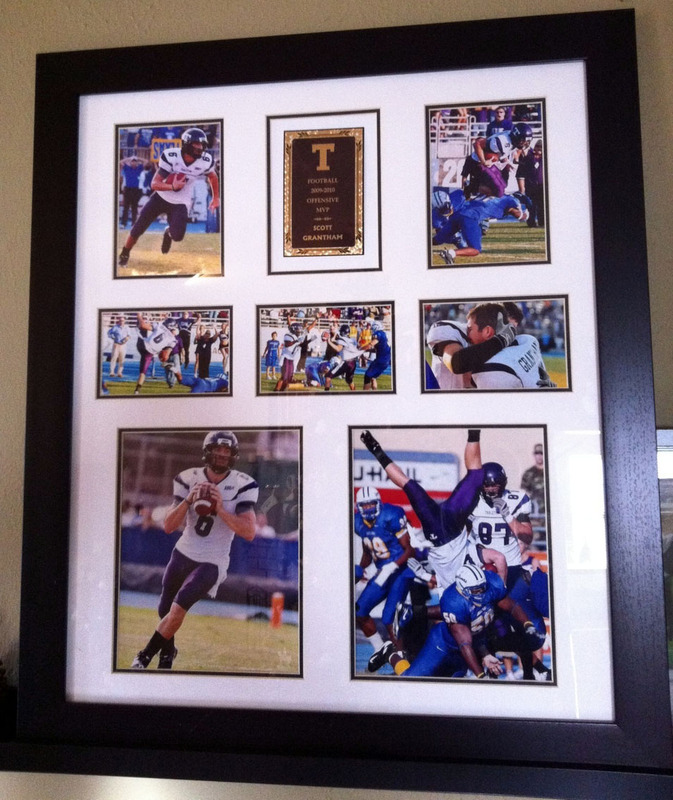 You can take any important moment- a special sports play, a special trip, high school graduation, etc., and put the photos into a frame like this. It's a thoughtful gift that will remind them of one of their favorite moments, and who doesn't love a walk down memory lane?